I felt the difference as soon as I entered the city. Laid out before our eyes was a city in its full glory, a beautiful and well-organized city. Aside from the military air field, which had been damaged in the German bombings, we saw no destroyed buildings; nor did we encounter the masses of refugees we had become accustomed to seeing. The city was vibrant and full of life. The military trucks that had picked us up brought us to an army base outside the city, which apparently served as a Red Army military school and had spacious barracks and storerooms. Here we met other refugees who, like us, had arrived from various locations near the areas of fighting. The base seemed orderly and well set up. We were welcomed by the city’s Jews, who provided us with food and clothing. One of the women, who knew the officer in charge, decided to help us. She took pity on us, four orphans dressed in rags, battered and exhausted, and asked the officer to house us in the base storeroom. The officer approved her request, but noted that he had no beds or mattresses for us. “Don’t worry, I’ll take care of their needs. I thank you for your cooperation,” she said. Taking the initiative, our hostess went from one Jewish home to another collecting food, clothing, mattresses and blankets. She returned to the storeroom after a short while with the donated supplies. I did as Ita directed. Finally, a faucet with running water! What a refreshing feeling! I took off my old, dirty clothes and put on the new ones. Evident in my old garments were all the signs of the suffering and hardships we had endured. I was so pleased that the clothes fit me and that Ita had even included clean socks in the items she chose for me. My sisters greeted me joyfully when I returned wearing my new clothes, admiring my new appearance at length. This was the first time in years that I had such attire and no one was happier than I in those moments. Representatives of a refugee organization, apparently UNRRA (United Nations Relief and Rehabilitation Administration), arrived at the base and recorded all our personal details. Ita made sure that all our names were registered and provided precise information. “It’s very important to keep the details exact, to make it easier in case Father or any other relative looks for us,” she explained after the officials had left. We were called to get our food a short while later. I don’t recall ever having eaten such a meal in my life. The aromas and taste were wonderful. The meal included soup and vegetables, freshly baked bread and fruit. This was the first time in all our years of wandering that we ate fresh, hot food, which was provided by the Jewish community of Kutaisi, who spared no effort in fulfilling our needs. Since we were not the first group of refugees to arrive, they were fully aware of the events of the war and all the suffering we had endured. Many had come previously and been taken in by this warm Jewish community, which opened its heart and assisted as much as it could. The local Jews had settled among one of the most cultured peoples in the Union of Soviet Socialist Republics. The Georgian nation boasted a history spanning more than two thousand years, and was particularly proud of its glorious heritage, which had produced great literature and poetry. They were honored to note that Stalin (Iosif Vissarionovich Dzhugashvili) was born in their state, in the town of Gori, though they bore little love for him due to his Great Purge in which many of the Georgian intelligentsia, as well as numerous others suspected of hostility to his regime, were murdered. Georgian Jews occupied a respectable place in the state’s economy and were involved with the wine industry and various types of commerce. It was difficult to distinguish between a Georgian Jew and a Georgian national. Both were tall, with a shock of black hair and a typical Georgian mustache, like Stalin. The women had tall, aristocratic bodies and long, flowing hair that lent them a unique charm. 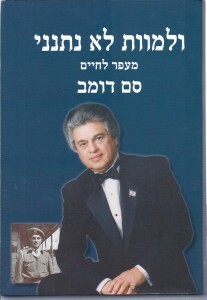 Having been used to typical Jewish names such as Lederman, Pinchuk, Feibush, Applebaum, Goldberg and the like, we were now exposed to others that ended with Shvili and Adze, exactly like the names of Georgian nationals. The language they spoke was also identical to that spoken by their compatriots, in contrast to the Yiddish we used to speak. This shows that this ancient Jewish community preserved its Judaism, but at the same time blended into the local life. In addition, it became clear to us that anti-Semitism had seeped into Kutaisi, albeit not to the degree with which we were familiar. It reared its head primarily during the Stalin era. We did not sense it; the Jewish community was free to live as all other locals. Kutaisi, the second largest city in Georgia after the capital Tbilisi, sat on both banks of the Rioni River. During the war period, the city’s population numbered about 150,000, of which 15,000 were Jews. Most of the Jews lived in their own ancient quarter, near the riverbank. It was an organized community, complete with institutions for conducting Jewish life. There were three synagogues in the Jewish quarter, the largest and grandest of which was at its edge, near the city’s other quarters. We went into the city one day, exploring one of its lively markets, where the aromas and the sight of all the fruits and vegetables piled on the stands drove me crazy. My eyes were, in particular, drawn to a stand filled with bars of soap. I sniffed around it and, exploiting the owner’s momentary absence, went over and, in a split-second decision, snatched two soap bars and left. Heart pounding and terrified of being caught by the merchant, I hurriedly disappeared in another area of the market, where I sold the soap and used the money to buy fresh bread, whose aroma wafted all around me. The wonderful taste of the Georgian bread, purchased in exchange for the stolen soap, remains with me to this day. Of course, I shared the bread with my sisters. Here in Kutaisi, we received continuous news from the war fronts and no longer depended on rumors and reports from incoming refugees. The daily war reports from the radio or newspapers reached us immediately and the news spread among the refugees like wildfire. All wanted to be updated on what was transpiring and to learn about those dear to them who were fighting on the front. Many had close family and relatives caught in the areas of battle, with no opportunity to escape. In my estimation, we arrived in Kutaisi at the end of 1944. The news we received was most encouraging. It was there that we first heard about Operation Overlord, launched in June 1944 when Allied forces landed in Normandy, France under the command of the American General Eisenhower. Before and during the campaign, Allied aircraft had bombed major German cities, greatly damaging their infrastructure as well as German morale. We eagerly absorbed every scrap of information and rejoiced at every Allied advance and German defeat. A British force led by Montgomery, together with an American force, conquered Brittany; and another, Canadian, force, took over Falaise. Paris fell in late August 1944. The joy of our French friend knew no bounds. He added his own interpretation of events. No one was happier than he to hear that his country had been liberated from German occupation. On a piece of paper, he drew for us a map of France and its neighbors and, with the aid of arrows that he had added, explained the progress of the war. Even more impressively, he came to the barracks one day holding a newspaper cutting with a map of Europe and the USSR. He indicated our location in Kutaisi and, with a pencil, outlined the torturous route we had taken from Arkhangelsk to Kutaisi. “Even longer if we take into account how far we had to go on foot,” Ita mused. “Very true,” agreed the Frenchman, as he continued to trace the course of the war on the map he held. From his responses to our questions, he appeared to have kept quite up to date about the war ever since we arrived in Kutaisi. Having finished, he folded the map carefully and placed it in his pocket. This map of Europe, the first I ever saw in my life, is etched in my memory. A few days later, we heard that the Russians had conquered Yugoslavia and were preparing to take over Poland. The news that our home was going to be liberated thrilled us. We followed the Russians’ progress in Poland daily, excited to learn of familiar cities falling into their hands one by one. We celebrated every German defeat and our mood soared, as was also evident everywhere in Kutaisi, though the joy was mixed with sadness and worry over the rumors about the number of war casualties per day. The radio reported the fall of Poland and the surrender of tens of thousands of German soldiers to the western military powers. All were taken captive and put under heavy guard. Russian forces opened another attack and conquered first Hungary and then Czechoslovakia and Germany. The German military was in retreat and under total collapse, with the Russians attacking from the east and the Americans and British from the west. In April 1945, after the conquest of Austria, Russian forces met with the Americans and British on German soil. We all understood that this was the end of Nazi Germany, but had not yet heard an official announcement. The officers’ club on the base where we lived had a radio from which the command received news updates. On May 8, 1945, the radio announcer informed the world of Germany’s unconditional surrender. We understood from the officers’ shouts of jubilation, echoing throughout the base, that something significant had occurred. The officers eventually emerged and apprised us of Germany’s surrender and the end of the war. The event was celebrated in the base with the opening of vodka bottles and endless drinking. The outburst of joy that we witnessed in Kutaisi knew no bounds and was shared by all, without exception. People hugged each other and blessed this marvelous hour. The masses spread throughout the city streets in celebration and it seemed as if no one remained at home. Soldiers were lifted in the air and flags flew all over. Improvised bands played national songs and dance circles were seen everywhere. With the waves of euphoria having subsided somewhat, reports began to arrive about the true magnitude of the Nazi extermination machine. Having failed to destroy all the evidence, the Nazis had their methods of deception and destruction exposed to the whole world. The death camps were opened to the liberating forces, who were shocked to discover one of the cruelest horrors in human history: the systematic annihilation of millions of Jews in gas chambers and crematoria. Not knowing who among our relatives had survived and who had found death in the camps, we were terrified. All our thoughts were now focused on Father, where he was and whether or not he had survived the war. Ita never ceased asking the soldiers. They tried to reassure us, and said that millions of people were as anxious as we were to learn the whereabouts of those dear to them. They explained that the registration set up when we arrived in the city would assist Father in locating us, and we must wait patiently. In several days, everything would be clearer. We all burst out crying, not disguising our emotions. The soldiers present became as emotional as we were—some even shed tears. “I have no idea, but I do know that entire units are in the process of being discharged. Most of the roads throughout Europe are open and many damaged railroad tracks in the USSR have been repaired; the trains are moving freely. In any case, trains are entering Kutaisi without disruption. You just have to wait patiently. I promise to pass on any piece of information that reaches my desk. The news your father received that you are alive and well surely made him happy, and just as he knew to find you, so too he will undoubtedly make his way here as soon as possible,” concluded the officer. “And you were alone this entire time?” asked the officer. “Yes, all alone. Four years of suffering, of survival and of wandering,” said Ita, overcome with emotion and wiping away tears. The officer looked at us admiringly, shook our hands and we left. Several days after our conversation with the officer, and without any prior announcement, Father arrived at the Kutaisi camp. It is hard for me to describe the emotional reunion. He hugged us over and over with all his might and with his familiar warmth. I do not recall if he cried, but his feelings did not abate for many hours. Not only did he live to see his children alive, but he found them healthy and sound. We had grown up in those four years since leaving Father in Minsk. Four years of war had toughened both him and us. He told us about the war zones in which he had served, about his desperate attempts to obtain any scrap of information about our fate, all of which were for naught. The truth is there had been no one to ask. The relief organizations had only recently begun to function, and it took them time to set things up. They were not always able to operate due to the bombings and heavy battles in the areas of fighting. They were also not accessible, especially to soldiers stationed at the front. Father related that he had heard of UNRRA only in the last few months and as soon as he could, had submitted a request to them to locate us. “They responded almost immediately. The representatives apparently knew of your exact location from the precise details you gave when registering in Kutaisi,” Father complimented us. He said that in order to arrive here, he exploited his good ties with Russian officers, who allowed him to board a military train bound for Kutaisi. As if we had not wandered enough until now, we were fated to resume our journey into the unknown. This time however, Father was with us. We awoke to a new day, filled with hope. Packing our possessions, we said goodbye to everyone we had met in Kutaisi. The parting was very emotional. The Frenchman was also there, shedding tears and telling Father: “You should thank G-d for blessing you with such special children. They survived the inferno until now, thanks to their courage and determination, and thanks to Ita’s devotion, wisdom and leadership. Father thanked our friend profusely for all his assistance and blessings, embraced him warmly and we said goodbye. I will always remember Kutaisi well. And I will particularly remember the Jews of that dear community, who spared no effort to help us. They fulfilled the Talmudic verse, whose essence has accompanied our nation throughout history: “All Jews are responsible for one another.” They proved that this, far from an empty saying, is indeed a supreme, fundamental value which has guided our people wherever we were, throughout the generations. Its practical application is mutual responsibility in every situation and under any circumstance. The Jewish community of Kutaisi truly taught us an important lesson on this topic.